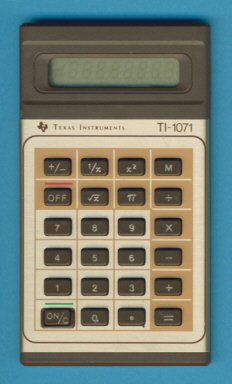 This unique TI-1071 was manufactured in Spain for the local market and is obviously based on the TI-1070. Designers at Texas Instruments' facility in Spain have chosen a brown color schema similar to the TI-1030 instead the bold colors of the TI-1070. Dismantling this rare TI-1071 reveals a printed circuit board (PCB) with the established TP0314 single-chip calculator circuit. © Joerg Woerner, June 4, 2009. No reprints without written permission.